T – Has to be said, I knew nothing about this game, didn’t even know it existed. Mike just had it on the gaming table one day and insisted I played it with him. 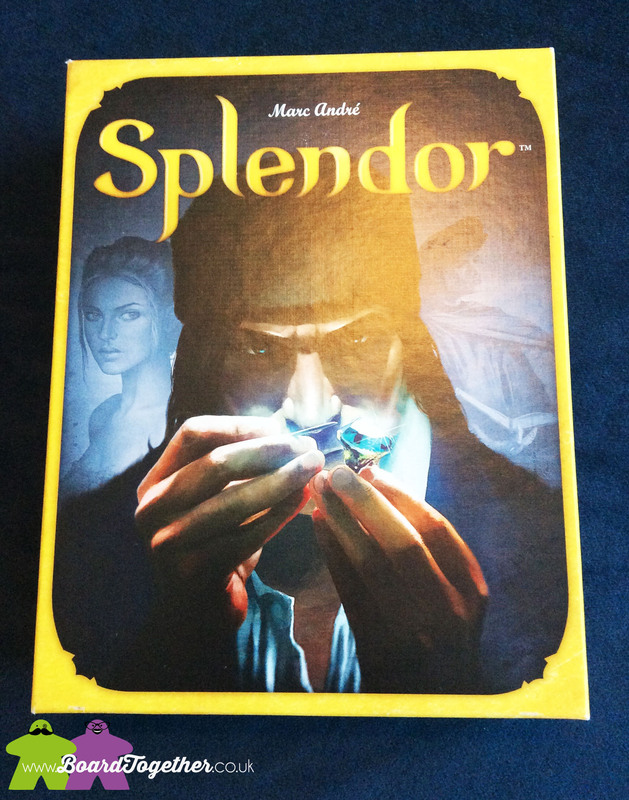 M – I had heard quite a few good things about this game on the internet and I thought the components were really nice. M – It’s a game that’s really simple but has a lot of depth and takes quite a time to master. You can quickly build your gems but making sure your being efficient and maximise the most out of your turn is really fun. T – Study the playfield. What colours do you need to get a visit from the nobles? What tokens do you need to get to gain the gems needed for this? Then just buy, buy, buy! 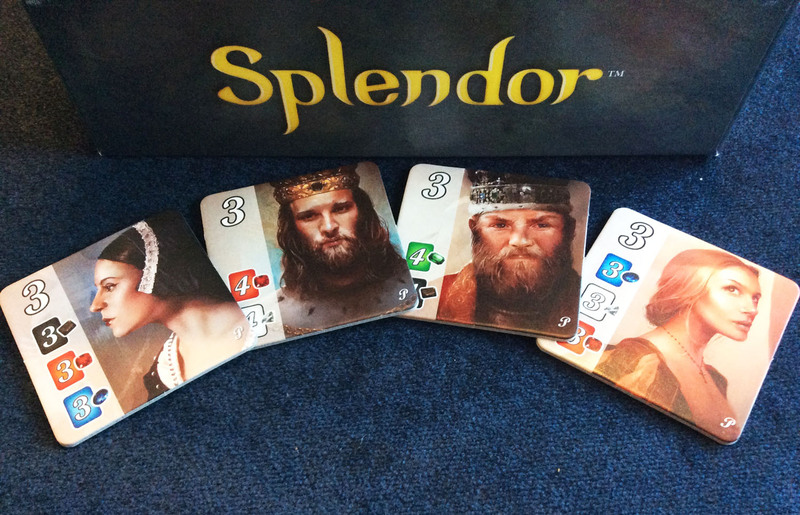 Aim for the nobles but keep an eye on higher scoring cards in the middle row. M – Don’t just plan on purchasing one gem card. 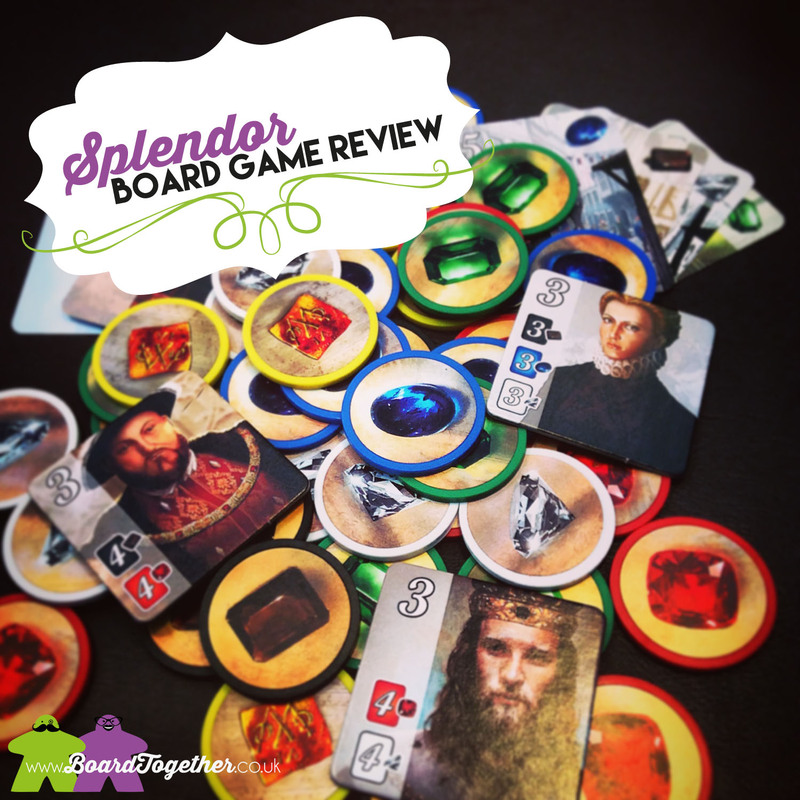 Look at all of the cards available and on your turn play for as many as you can because you can bet when your turns over the other player is going to pick the card you want. Also look at the nobles that can visit and make sure you are picking the most common cars that are needed. T – Very original and nicely done. The gems are lovely vivid colours. 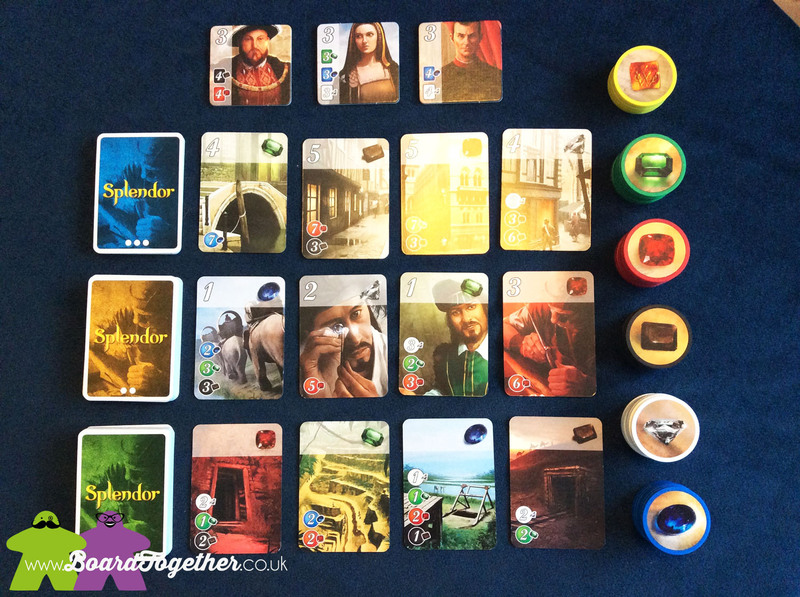 The theme of the game is a little stretched, from mining gems to trading in city buildings, but the artwork compliments it beautifully. 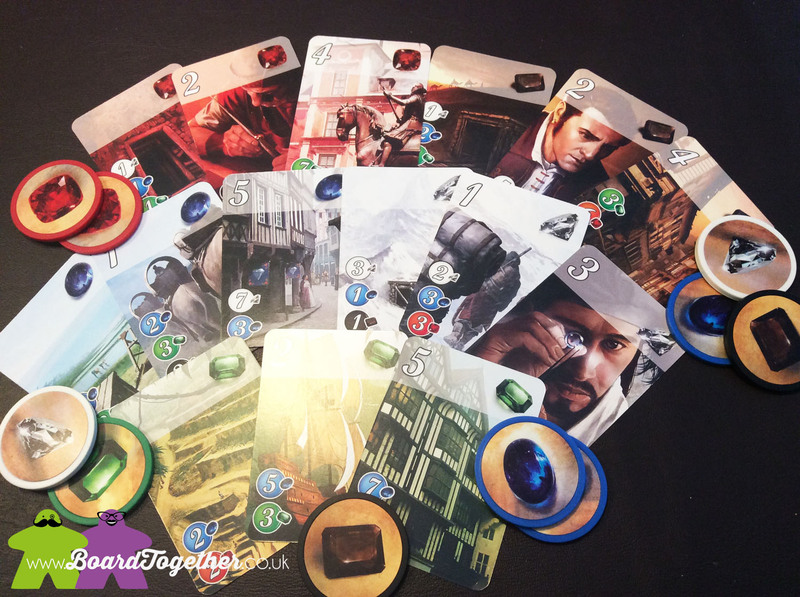 The first row of mining cards feel desolate and lonely, then the merchant cards step it up a notch in the next row with ships, traveling and inspection art on the cards. Finally the top row shows buildings and cities and it feels like you have achieved something when you grab one of them for your hand. M – Really nice artwork, you can see that someone really took pride in the game and wanted it to look good. I love the fact that each of the levels has a theme, first is the mine, second the transport and third the people. The real question is, do you have any idea who the historical figures depicted on the noble tiles are? There is the obvious Henry the 8th, but other than that? Let us know who you think they are below, we would love to hear from you. 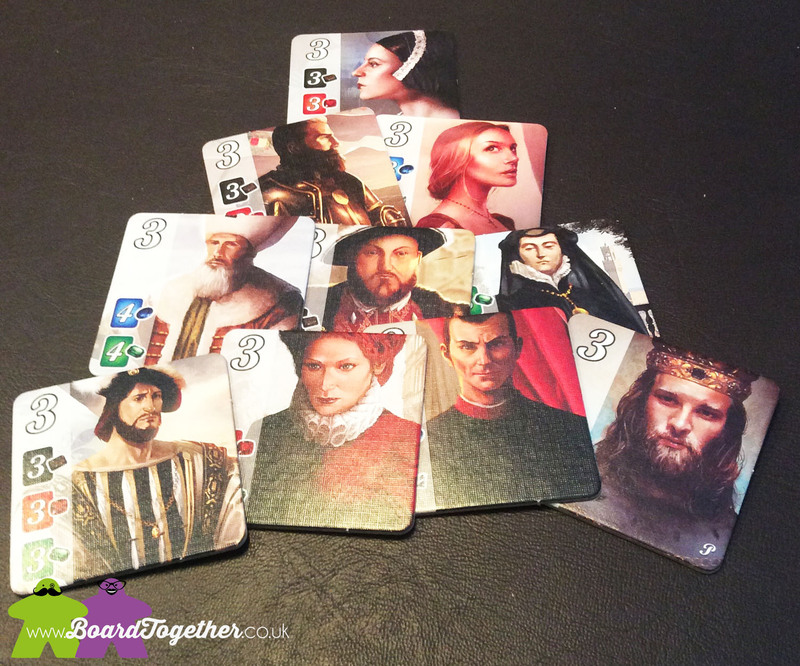 T – The cards are nice and the nobles are on thick cardboard making them stand out. But it is the Gem tokens that are brilliant. 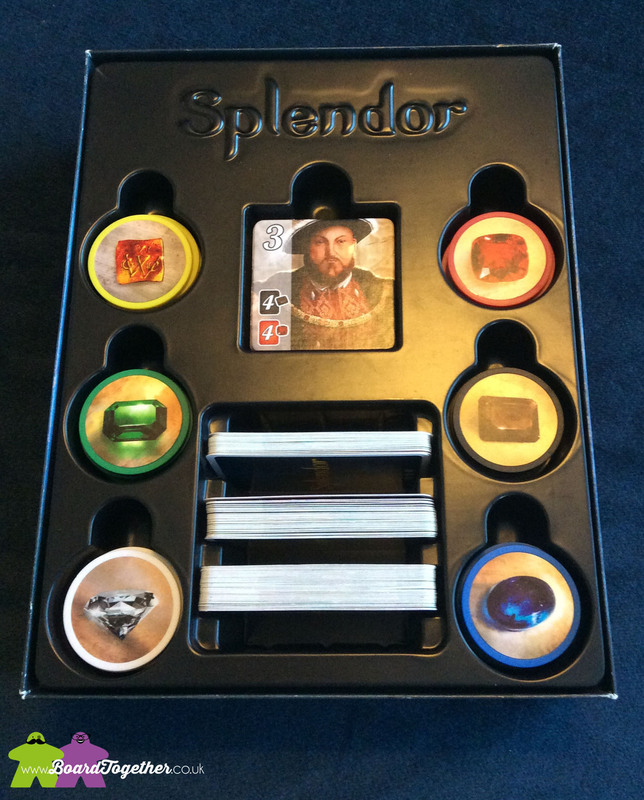 They are poker chips with stickers on depicting each colour gem. With the weight behind them they sound great and feel really tactile, just fun to use. M – Amazing, these chips weigh a tonne and you can really feel the quality in the components. The box inlay is also really well thought out and speeds up the set up and putting away of the game. T – Although the box is 90% air with that inlay! T – I found this game a bit frustrating to start with. The other players would be gaining points and nobles left right and centre and I was just happy to be getting another gem card of the same colour!! I can recommend you stick with it, once you get the hang of it there is nothing better than swiping a noble out from under another players nose!! M – Winning is really great at this game because it builds very fast and trying to keep ahead of the other players in points become quite stressful. You can get blinkers on and focus on your own sets of cards and gems then suddenly you look up and the player next to you has 14 points and is about to win. M – Love this game so much and will play it any chance I get. Just building you collection of gem cards is fun and then boom it’s over. Quick and fun. Basically you collect chips or you collect gems, the first to 15 prestige points triggers the last round and the person with the most points wins. These count towards collecting cards, by matching the number of chips needed. All of the cards you buy increase your wealth as they give you a permanent gem bonus for later buys; some of the cards also give you prestige points. You can have up to three reserved cards. If you take a card to reserve you also get a Gold token, these are wild tokens and can be spent as another colour when needed. 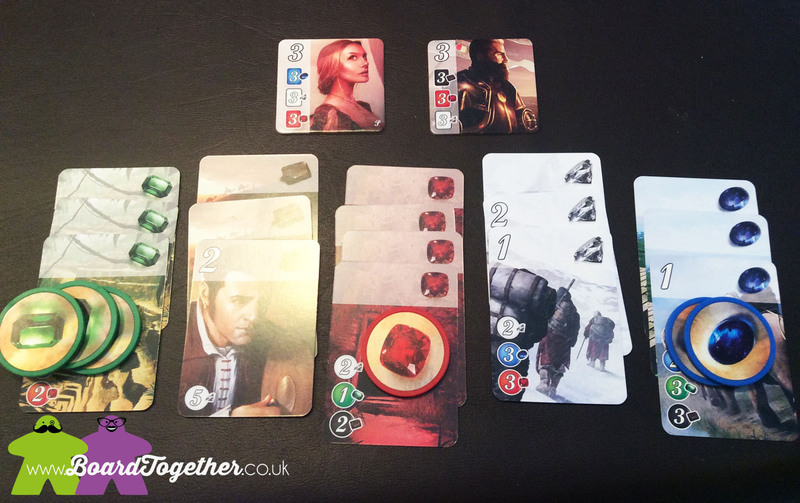 We were lucky enough to get our hands on the Noble Promo Pack at the UK Games Expo. Does not really add much to the game, but it is nice to have more choice.